Anyone who’s ever been to SXSW knows you have to be prepared for anything and everything. It’s true for musicians, surely, but also for us journalists too. Two years ago, I was promised by a journalist from Louisiana that I’d get equal billing on an interview I helped record for him; needless to say, the credit didn’t appear when the video went online, leaving a bad taste in my mouth. 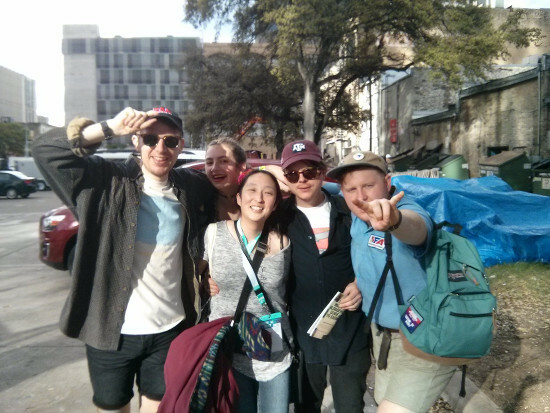 (The interviewee in question is now a good friend of mine, and Mr. Louisiana is nowhere to be found…) I didn’t think I’d ever have to tag team on another interview again but last week in Austin for SXSW 2017, a blogger (or a super fan even, possibly?) asked me to tag team on an interview with Manningtree rockers SuperGlu (no “e”), and here are the results. Unhelpfully, the mystery man never introduced himself or his outlet, so I honestly can’t credit him until he surfaces.